2017 Rotarian of the Year, Tina Fox!! 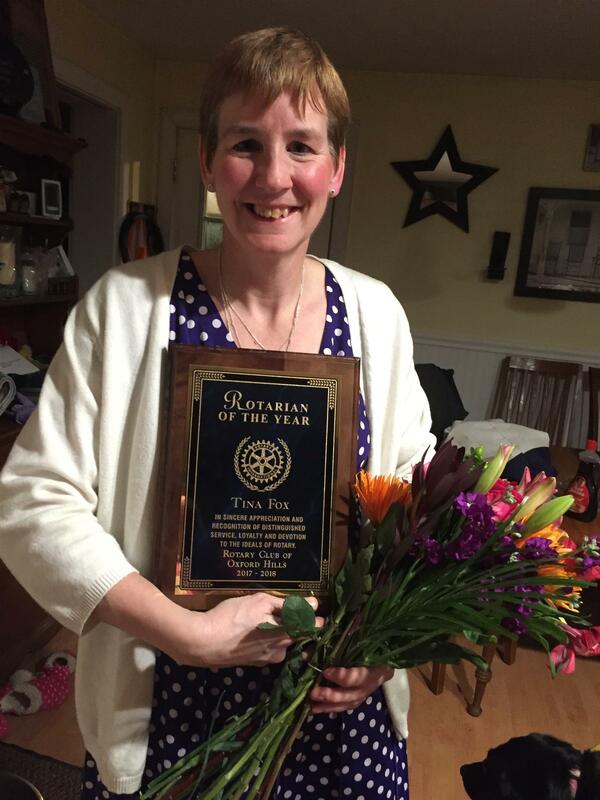 The Rotary Club of Oxford Hills is pleased to announce their 2017 Rotarian of the Year, Tina Fox. Tina was presented a plaque, flowers and a Paul Harris Fellow award at the club’s banquet held on Monday, March 26 at Maurice Restaurant. Tina has been a member of the club for 2 years, and has done a lot in a very short period of time. She is currently the advisor at OHCHS of the Interact Club (high school version of Rotary) and has been working with the students in various areas to promote community service within their school and the OH community. They won 1st place in the Oxford Hills Chamber of Commerce 2017 Christmas parade, in the non-profit category, and were so pleased with the win. Tina has also been spearheading the Student of the Month program as the liaison between the school and the Club. Each month, students and family are invited to attend breakfast with the Rotarians and be recognized for their efforts in school. Tina is also chairing the upcoming May Day Play Day, a fun, free day for the children in our community. She has lots of activities planned, to help make the event bigger and better than last year. She is recruiting not only Interact students to help, but also getting many of the students from the sports team involved as well. Tina was nominated for the award by members of the Rotary Club, and was chosen by a committee of the Club’s last 3 year’s Rotarians of the Year. Tina was very surprised and pleased with the recognition and was a very deserving recipient. CONGRATULATIONS TINA! !